Several years ago, in attempt to engage our kids more in bedtime prayers, we came up with a simple system for prayer requests. We ask them three things: What are they thankful for? Who is a friend they want to pray for? And who is a sick person they want to pray for? It worked well, I guess. Maybe a little too well, as I don’t seem to know how to get them to pray for anything else as they get older. Oh well. There are worse things. A couple years ago, I wrote about the time that Maggie, then age 4, wanting to pray for a young boy named Emmanuel at the hospital that she had overheard me talking to Rachel about. I was reluctant, knowing that the boy’s prognosis was very poor, and fearing having to discuss his death with Maggie. However, he got better despite my pessimism, and I saw the grace of God through my daughter’s faith. About a month ago, Maggie and Ben were stuck on their third prayer request. They couldn’t come up with a sick person to pray for. So I asked them to pray for a young man named Claude on my service. He was 34 years old, and came in with raging meningitis in a deep coma. We started him on antibiotics, but after about three days, he wasn’t waking up, and almost just as bad, he had stopped making urine. I was worried about him, and so he came to mind. We prayed several nights in a row for Claude, and it prompted some interested conversations about “why people are in comas”, etc. He didn’t immediately get better, but after a couple more days, he woke up. A few more days and his urine returned, and his kidney function started improving. He went home in good shape. It wasn’t impossible, but it was definitely against my expectations. I remembered Emmanuel from a couple years ago. I decided to do this more regularly. After Claude, I moved on to the next case. Gloriose was 45. We weren’t sure if she had bad meningitis or bad malaria, but she was alternating between comatose and agitated enough to rip out her IV. It had been several days on maximal therapy without a lot of benefit. I told my students I was going to ask my kids to pray for her. The kids were fine with that. Her sixth day in the hospital, I walked in to find her sitting on the edge of her bed. She shook my hand, meeting me for the first time. I also saw her six-month old baby in the bed next to her. I sent her home today, so thankful that her baby has a mother. I memorized this verse when I was a teenager. I don’t know what I thought it meant then. Maybe I thought it meant that people who followed God’s commands really well could pray and their prayers would change things more than someone who prayed who didn’t follow God’s commands as well. And maybe that’s basically right. But it gets more complicated the more deeply I believe that the only righteousness that I have is that which was given freely to me by God because of his unmerited love. By his gift, I am righteous, so I guess my prayers are powerful. And it gets a bit more complicated when I think about my kids. I don’t believe that they are heard because of their obedience to God’s laws. I do believe their prayers are powerful, and only partly because of what I’ve seen. Beyond that, it just comes easy to trust that their prayers are heard. Maybe I believe that because they are my kids and I love them, and I can’t imagine not wanting to listen to them praying for someone who is suffering. Maybe God feels the same about me. Maybe that’s the love that made him sacrifice so much to make me righteous. Maybe it’s the same love that gives my prayers whatever power they may have. Our faithful readers will know that there’s been a LOT of construction happening at Kibuye over the last 3 years. Brick is one of the main “ingredients” that is used for beautiful buildings such as this newly completed local school building. You will often see stacks of bricks cooking in a field or sitting by the side of the road waiting to be sold (for about 1 cent a piece). 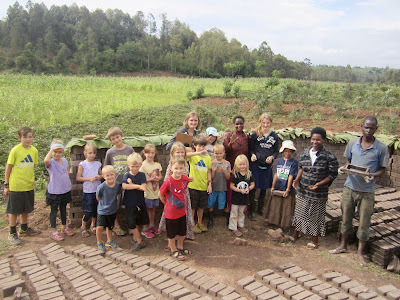 For Kirundi class at Kibuye Hope Academy, we recently took a field trip (literally walked through a field to get there!) to a local “brick factory” to find out more about this process. We met Irakoze who graciously explained how you mix some dirt but mostly clay (ibumba) together and then put it into a wooden mold (iforoma). After sprinkling a little dirt on top (to keep it from being too sticky I assume), you pull it out of the mold and set it in neat rows in the sun to dry for 2 days. 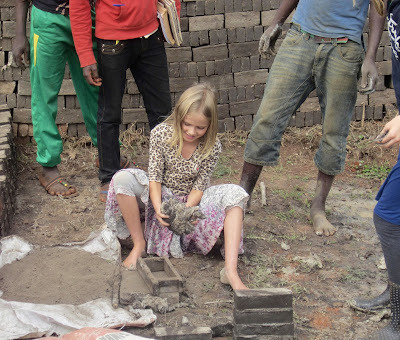 Irakoze was kind enough to allow the kids to mix the clay with their feet (gukata ibumba) and make bricks using the mold. Not sure if he’ll end up keeping them! After the bricks (amatafari) have hardened and dried in the sun a couple of days, they are stacked to the side until there are enough to make an ifuru (shown below). The holes at the bottom are filled with wood to make a fire. 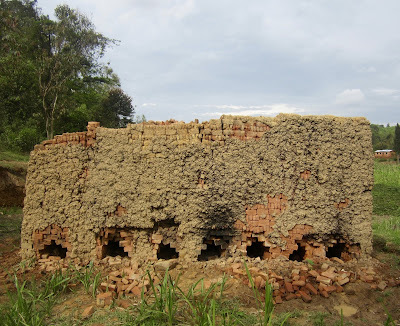 The holes are then covered up and the outside of the brick oven is covered in mud or leftover clay to keep the smoke & flames inside. The bricks cook for about 3-4 days and after that time the color will change from the original gray to a reddish color. Once the bricks are cooled, the mud is removed and bricks are taken from the top. 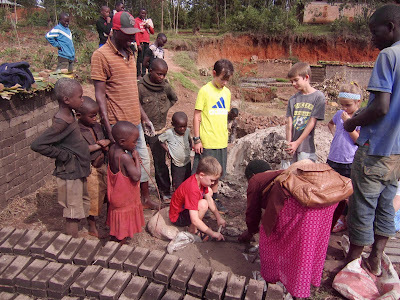 The final step is probably the most labor intensive of them all -- getting the bricks from the field to the side of the road in order to sell them...without a vehicle, a couple at a time. It gives me a new appreciation for all the work that went into making our own homes, not to mention the many other hospital & community buildings that have been built at Kibuye by many Burundian craftsmen (and women). Murakoze (thank you) Irakoze and our Kirundi teachers for such a wonderful learning opportunity. Well, in order to try and balance out all the depressing posts (from us) and news (from the US) these days, here's a fun little post to cheer everyone up. 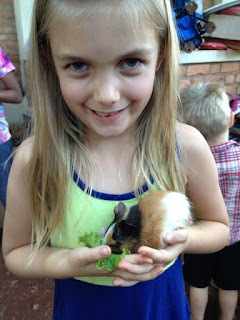 :) Kibuye has been overrun with guinea pigs! Turns out some of our new teammates are animal lovers. There was a fundraiser at a Bujumbura school...you know, some schools in America sell wrapping paper or magazines? Well, in Burundi apparently they sell guinea pigs and rabbits. 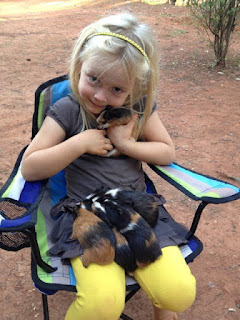 Once the kids heard that guinea pigs were $1 and rabbits were $1.50, well, the orders started pouring in. Darrell graciously brought back several cardboard boxes full of furry little bits of love. Seven guinea pigs and one rabbit. The kids have had a blast feeding them grass, lettuce, carrots and even (surprisingly) pineapple. 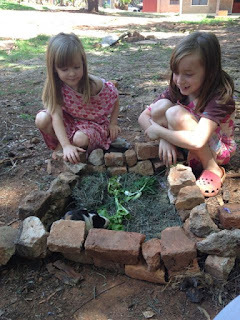 They have used all the leftover bricks piled by the Baskin house to make little "homes" for the guinea pigs to run around in. 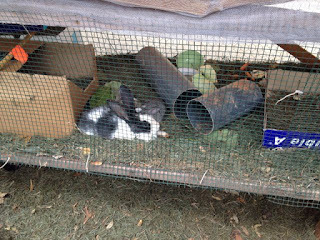 And then, of course, what's the use of only one rabbit, who's a boy no less? 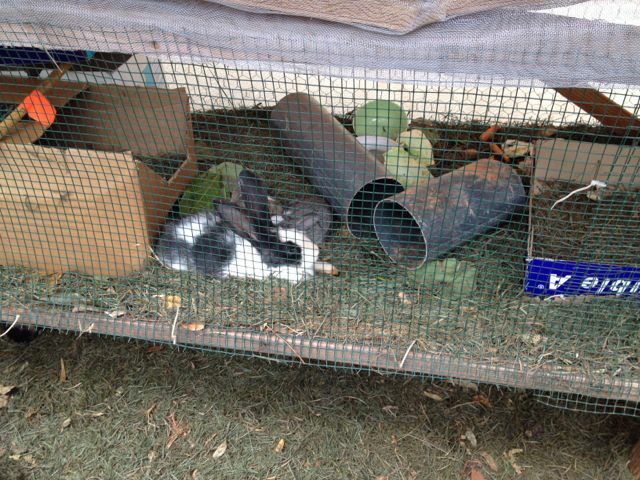 The last Buja trip brought back two more cute little baby bunnies, a big hit. Hoping that these little ones last a long time and continue to bring much joy to the team! 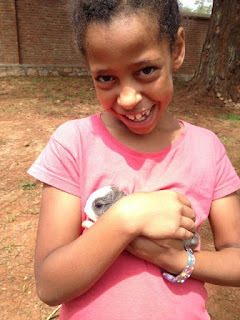 Abi and a new baby bunny! Today was a hard day at the hospital. It shouldn't have been that way. It's Saturday. I only go in to round. It takes a couple hours at most. And my adult medical service is currently less than ten patients. It should have been easy. But it wasn't. I always start rounds by asking about new patients, so I can maintain an active list of everyone I'm taking care of. There was one new patient, a young guy in a coma, probably from malaria. There had been another new case, a 60 year old guy with severe malaria, but he died during the night, only about four hours after his first dose of antimalarial medicine. I read through the chart as the student told me the story. He had actually spent the last seven days in the hospital, as the caretaker for another patient, which means he got malaria here at the hospital. Two days ago, he wasn't feeling well, and he wanted to be seen. Registration told him that he needed to pay the 1200 Burundian francs (about 50 cents) to see a doctor. Normally this cost is not prohibitive, but he refused, whether out of severe poverty or foolishness, I'll never know. He got sicker, and then went back to the ER last night, his blood swimming with parasites, and his platelet count bottommed out. We could only offer too little, too late, and he died. It's so incredibly senseless. He had a simple disease for which we have medicines. It's not usually 60 year old men who get so sick from malaria, since they have a partial immunity. He was already at the hospital. 50 cents. We pray, and we start rounding. The second case is a lady that came last Tuesday. Apparently, in June, she got into an argument with her husband, and he locked her into a room, occasionally sending her a bit of food. He never let her out. At all. Until Tuesday, when his neighbors and the local administrator showed up and forced him to come to the hospital. Now she is wasted, too weak to sit up without help. She has tuberculosis, at least in her spine, and probably in her lungs, probably as a result of her weakened state. The husband and her family are supposed to be staying with her in the hospital, but they are always trying to skip out on her. Yesterday, we talked to the nutrition service about adding oil to her porridge to help her nutrition. They brought a supply to last the weekend, and her sister-in-law apparently stole it and took it home. Her belly is distended, especially in her pelvis. I think maybe her bladder is retaining urine, so after rounds, I grab the ultrasound to see what I can find. I find a tiny beating heart. A baby. She is pregnant. I wonder when in this tragic story she became pregnant. I wonder if we can get her through it, and what kind of circumstances this baby could be born into. I pass by the ER to take care of one last thing and to tell my nurse about the pregnancy. A mom is holding her chunky five-month old, who was just referred from a health center. Before our eyes, the baby stops breathing, and mom bursts into sobs. We rush to get oxygen started. I notice that the baby's tongue is pale, and pull his eyelid down to find an utterly white conjunctiva. The baby has died from severe anemia, and there is no way we can transfuse him fast enough to get him back. We stand with the mom. She sobs and buries her head into the side of my med student. We pray. We cry out for peace. For peace that passes understanding. I thought about not writing this blog. I didn't want to share it on the heels of Rachel's story about T. Believe it or not, we want to balance these things out. Our lives have a lot of light, as well as a lot of darkness. Everyone's life does. 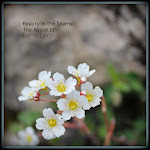 I decided to share it for two reasons: First, I just need to get it out. I need to tell the stories, because there is some small comfort in sharing it, like someone else really does share the burden. But second, I am writing this because this is how it's been this week. I don't know why. I think that things just come in waves, sometimes. But I know that many of us have had very hard outcomes in the hospital. So, in the interest of full disclosure: Voilà. There you have it. What do I do with this? I don't know. I came home, and I found headphones (so as to listen loudly) and played Andrew Peterson's "The Sower's Song" multiple times. It starts: O God, I am furrowed like the field. I can identify with that. Certainly I have rubbed shoulders with some people who can. It ends with a near-shout: [The word of the Lord] will not return void! You will be led in peace and go out with joy. I try to follow the sweep of it, to identify with the promise at the end, just as I identified with the sorrow at the beginning. It helps somewhat. It feels good to shout a promise, sort of like a defiance of the darkness, even if I don't see what is going to happen. I saw this as well this morning. When I found that baby on ultrasound, I caught a great profile image, with the curve of the nose, the chin, the shoulder, the elbow and the hand all visible. We told the mom, this long-suffering tortured mom. She looked at the screen and her voice caught in her throat: Akomeye? Is he OK? Yeah, I think he's fine. Light and hope. There is more than we think there is, even on the bad days. It’s been a rough couple of weeks, clinically speaking. 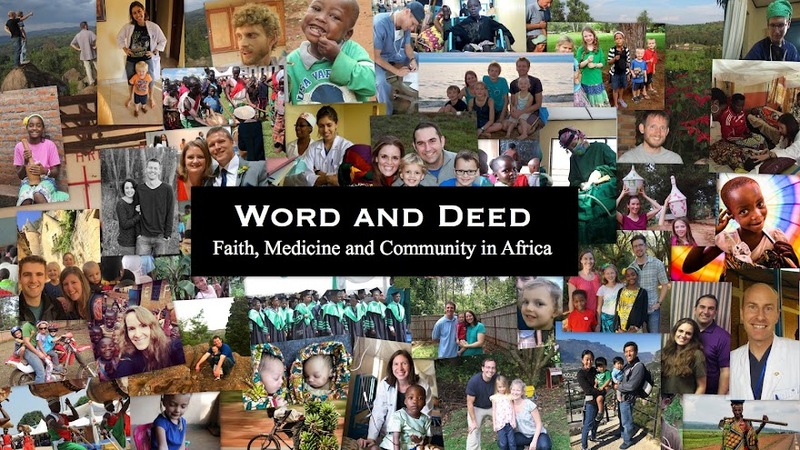 I have heard it said that in missionary medicine your highs are higher and your lows are lower...and I feel like that’s been the case for me recently. In fact, some days the space between triumphs and failures are measured in seconds and minutes. That does put me on quite a roller coaster of emotions. There have been a number of maternal and fetal deaths lately, which weigh heavy on my heart. In the last 3 days alone I have come face to face with the reality of gut-wrenching evil, watched a woman slip away before my confused eyes, and have to live with the knowledge that a decision I made, for right or for wrong, contributed to another woman’s death. Days like this, the magnitude of the decisions I make as a physician loom larger than normal. We all make decisions, all the time, about so many things. Usually those decisions matter so little in the grand scheme of things. But sometimes in medicine, they cost a life. I am tempted at the end of the day to come home and wallow in my sorrow. To grieve over all that’s wrong with the world, and to focus on the sadness. There is so much to grieve, on both sides of the ocean right now...for friends and family in both our communities. But I think back to the Israelites in the midst of their wanderings, and in the midst of their years of rebellion and captivity. God gave them signs and wonders, stones and altars along the way so that when things got difficult, when it seemed like God no longer cared, they could look back and remember his faithfulness. So tonight, that’s what choosing to do, too. I’d like to share a story of faithfulness with you. What started off my “rough couple of weeks” was one patient in particular. Her name is T. She first came to see me in April at the beginning of her 5th pregnancy. She had a history of preterm deliveries and one term fetal death before a C-section...so, no living children. I wish this story was more exceptional but it’s a sadly common story. We came up with a plan to try and prevent her from having another preterm delivery. I did a few ultrasounds, she started on some medications, and we decided to admit her to the hospital at some point in the future to give injections to help the baby’s lungs mature faster in the event of a preterm delivery. Fast forward to mid-October. T was hospitalized on my service; her water had broken. According to her chart, she was now just 4 weeks before her due date, and the baby’s heartbeat was strong. We rejoiced together, and planned a C-section to deliver this baby. In the back of my mind, I put on my mental checklist to go back to my office and check the ultrasound records to confirm her due date. But the day was busy, as most are. The morning passed in a whirlwind and soon I was walking into the operating room where she was already prepped and draped. I made the skin incision, and opened up the uterus. I slid my hand inside to cup the baby’s head...and again, in the back of my mind, thought to myself, this head seems smaller than I expected. I delivered a crying baby girl and showed her to T, then passed her off to the nurse. But as I sewed up the uterus, I kept turning to look at the baby girl. She was no longer crying. The nurse seemed solemn, and within minutes whisked the baby off to the NICU. She came back to say that the baby was much smaller than normal for this age, just under 3 pounds. As soon as the case was done, I hurried off to the NICU. The NICU nurse and the students were assessing that the baby was actually 8 weeks early, not 4 weeks. I found the time to check my ultrasound record. They were right. I hadn’t double checked the due date...the chart was wrong, and I had delivered the baby too early. My moment of joy over T’s first live born baby instantly disappeared, replaced by a sinking pit of despair in my stomach. I ran through justifications in my head (her water was broken anyway, maybe the baby has a better chance to survive now, it wasn’t ME that wrote down the wrong due date) but I still felt personally responsible. We could have waited a few days and given those steroids to help the baby’s lungs mature, but we didn’t, or we could have tried to let her mature in the uterus for a few more weeks, but we didn’t, and now she was having difficulty breathing in the NICU. I went home defeated. I didn’t go back up to the hospital the next day (I only work three days each week) but I didn’t want to ask Alyssa about how the baby was doing. I felt ashamed. That afternoon, a friend called and as we discussed the case she reminded me that I was neglecting to leave space for God’s sovereignty. True, our decisions can be weighty and life-changing, but ultimately, God is the one in control, not me. The next day I returned to the hospital. My student found me, and gave me good news that in fact T had been hospitalized several weeks earlier and had been given those important steroids. I visited the NICU and her baby was off oxygen and breathing better. T was recovering well from her C-section. As I type this, T’s baby is now 2 weeks old. No baby of hers has ever survived this long. She is still tiny and still vulnerable, but doing well. From time to time, especially on my difficult days since then, I poke my head in the door of the NICU and my eyes meet T’s, as she holds her daughter. We smile. I wave, and then close the door. God’s sovereignty. His faithfulness. It is hard not to be overwhelmed by thinking of all the babies this week that don’t have mothers, or the mothers who don’t have babies. There are many. But from time to time, redemption happens, and I pray that I can always bring these redemption stories to mind.